Once French fry oil has served it’s culinary purpose, it can see a second life being burned in certain diesel car engines. Today’s Nice Price or Crack Pipe Citroën is a French oil burner, but will its price be deemed tasty? The Beatles advised us all to Get Back, and to be happy about being Back in the USSR. They never however, and I mean never, would have counseled through song the purchase of yesterday’s weirdo-in-a-can backwards 1954 Bel Air. Unsurprisingly, 92% of you agreed with the Beatles. So far this week we’ve had a panoply of perversion on NPOCP. From Monday’s picayune pickup, to a van that was kind of a drag, and yesterday’s 20/20 hindsight Chevy, it’s like the circus is in town. We’re giving the freaks the day off today, eschewing oddity for the ordinary, and going with something so mundane that you might not even bat an eye passing one on the street. 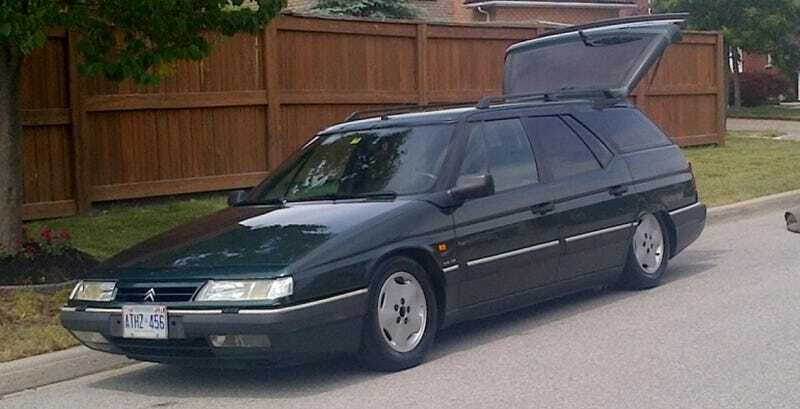 What we have to bring us back to normalcy and center is a 1994 Citroën XM diesel wagon. Yeah well, normal is a subjective term, and don’t you judge me. After all, while not Leave It To Beaver levels of normal, this beauty is a turbo diesel 5-speed wagon of remarkable space and comfort and features a ride that's akin to floating down a river on the downey soft back of a mighty and petulant swan. Citroën's XM was produced from 1989 through the last year of the last Century, and has been described by many as the last true Citroën. Designed by Bertone the XM is not only noteworthy for its technologically advanced mechanicals, but also for its angular and capacious body. The executive class car bettered its CX predecessor in pretty much every interior dimension other than dashboard design weirdness, and at two the XM doubles the number of steering wheel spokes offered to its driver. This estate adds even more room to the roominess offering a huge load area. That of course came at the expense of dulling the hatch sedan's funky monkey back end with its extra wind-blocker glass for when the hatch is raised. Of note on this particular car is the mileage, which clocks in at over 200,000 miles. Those miles have been international too. According to this article on AutoWeek's site the seller bought the car on a trip to England, however the big Cit was originally sold in Italy, and while it was first registered there in 1994, it was actually built in '92. Bought in Jolly Old, it was then shipped to Canada by its current owner, where it now awaits a new one. That AutoWeek story pegs this XM as having the normally aspirated 80-horse diesel four, but the ad says its the turbo, and it's badged Turbo D12, so it most likely sports the 112-horse puffed up oil burner. That gets a 5-speed stick in a supporting role and of course, like Citroëns from time immortal, the power is transferred to the front wheels. The seller claims that the timing belt was recently renewed as was the complex hydraulic system's fluid which I have it on good authority is actually made from pureed leprechauns. There's no rust and while the body exhibits a few scars, the seller claimed in a now-ended eBay ad that the headlamp units are both new. On the interior front, the clothe seats look perfectly serviceable, and while this is an exec-class and a Citroën the HVAC is all manual and pretty pedestrian in both appearance and function. Its A/C also apparently needs a recharge. This is said to be one of only two XM estates in the Americas, and the only such beast in Canuck country. Just considering the rarity both here and in Europe, this car could potentially command a premium. Add to that the fact that it's a diesel 5-speed estate that's funkier than George Clinton and you might just find its $15,000 asking price to be worthy of consideration. Or maybe you won't. What do you think about that price for this French express? Does that flip your beret? Or, does that price drop this wagon out of the fryer and into the fire? Hemmings Classifieds, or go here if the ad disappears. A tip on the lid to Mr. Blandings and his Dream House for the hookup!